1. Don't You Want to Go to Heaven? 1. Don’t You Want to Go to Heaven? Written by Wally Fowler, a founder of the group that became the Oak Ridge Boys, and Paul Kinsey; our version is based on the arrangement by Robin and Linda Williams. Dan leads a cappella. 2. Keep On the Sunny Side: A.P. Carter, arr. Ian Tyson and Sylvia Fricker. More recently popularized in O Brother, Where Art Thou? 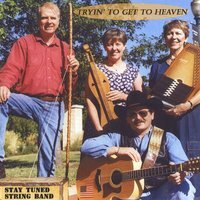 Linda leads and Dan harmonizes on verses; Jenny plays joyful AutoHarp and harmonica; Dan guitar, Bob one-string bass. 3. Blessed Quietness: A Salvation Army standard written by M.P. Ferguson, ca. 1897. Learned from the British group Beggars Velvet. Dan leads, with interlacing harmonies by Jenny, Bob and Linda; Linda lever harp, guitar. 4. Rise Up Lazarus: A rousing number by Emory Gordy, Jr. and Patty Loveless. Dan leads and guitar; Bob one-string bass. 5. Go Tell John: Greg Sublett, Anthony K. Music; arrangement by permission of The Rarely Herd, an excellent Ohio-based bluegrass band. Linda remixed a recording from our first CD (Quartet Edition). She felt the song too good to leave off this compilation of our favorites. Based on a story told in the gospels of Sts. Matthew (11) and Luke (7). Dan leads a cappella. 6. By the Mark: An excellent song written in recent years by David Rawlings and Gillian Welch in the old-time country style. Linda leads and banjo; Dan guitar. 7. Father I Stretch My Hands to Thee: A standard by many black Gospel quartets. Our arrangement is based on that of the Nashville Bluegrass Band. Dan leads a cappella. 8. Walking My Lord Up Calvary’s Hill: Trad., as recorded by Wilma Lee and Stony Cooper. Linda and Dan sing; Dan on guitar. 9. I Like the Old Time Way: P.D. (Joseph L. “Smilin’ Joe” Roper). Bob leads on this happy favorite. Dan guitar, Jenny AutoHarp; Linda hammer dulcimer, Bob one-string bass. 10. Fishers of Men: A stunner by Rhonda Vincent. Linda leads a cappella. 11. Children Go Where I Send Thee: Trad., arr. Ricky Skaggs. Deservedly popular with folk, bluegrass and gospel groups. Dan shines on vocal lead and guitar. 12. Oh Lord, Don’t Leave Me Here: Trad. Many versions. Ours is from the Virginia-based bluegrass group, The Country Gentlemen. Dan and Linda lead a cappella. 13. Gloryland: Trad. Also many recordings of this great song. The key change in verse three seems to be a standard arrangement. Linda is angelic lead a cappella. 14. Give Me Just a Little More Time: Trad. (E.C. Ball). We heard it by a Canadian group, Finest Kind. Bob leads, Jenny on harmonica, Dan guitar. 15. Anchored in Love Divine: A.P. Carter. Linda leads and hammer dulcimer; Dan and Jenny guitars. 16. It Soon Be Done: Trad. Heard on Folk Legacy’s recording of the New Golden Ring, Five Day’s Singing, a source of many terrific songs. Dan leads a cappella. We hope you like these songs as much as we do! Except where noted, all songs are four-part vocals, arranged by the Stay Tuned String Band. Produced by Linda Nachtrieb, Joliet, IL. Cover photo by Bill Petrovic, Joliet, IL. CD liner, CD reproduction and packaging by Digging Records, Homer Glen, IL.